Sports Clip: The plastic bit clips over the BTE aid and the wire bends underneath the ear. Having nearly lost one of my Siemens Aquaris Waterproof Hearing Aids during my recent walk (http://www.theultralighthiker.com/spots-hunting-adventures-mystery-river-3/) I have had some feedback from a reader who has managed over time to lose three of them, all covered by insurance at the time, but he has now been refused insurance, as the bastards do! Given that most Oz audiologists want @A$7000ea for them; these folks http://www.hearingsavers.com.au/ A$4200 and these folk http://www.thehearingcompany.com/ US$1595 (= A$2248!) are a sight for sore ears! Still, you wouldn’t want to lose/destroy too many of them, which is why I opted for this model – the world’s only Waterproof hearing aid, as I had previously had lots of issues with my older aids getting wet/dying etc. 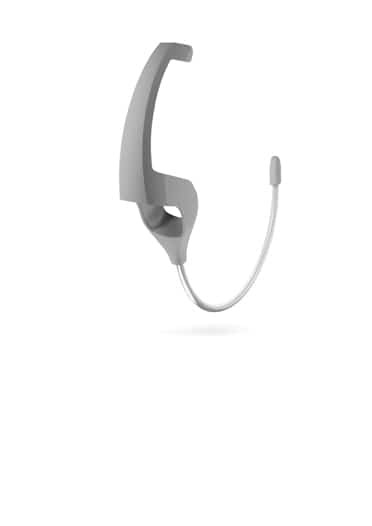 You CAN get a ‘Sports Clip’ for the Aquaris (http://precisehearing.com/hearing-aid-accessories/siemens-aquaris-optional-sports-clip) which has a covered bendable wire which additionally secures the aid below the ear. Also Siemens have a ‘Concha Lock’ for RIC hearing aids (comes standard with Aquaris) which do help a bit. My reader has decided to have his ears pierced and to connect the aids to studs in his ears – which is going a bit far to me (do not like cicatrices anyway! ), but reasonable in view of his insurance situation. You could also slip the arms of your glasses through the split rings then link the arms with one of those neoprene or etc glasses ‘keepers’ so that you don’t lose both. The spilt rings can be slipped on the receiver of RIC hearing aids before attaching it to the aid, then use the cord/micro cord lock method, etc as above. I will be pursuing one/other of these measures to ensure I don’t lose my aids hiking/canoeing etc as I am not, (contrary to rumour) made of money!